Overcast. Low 56F. Winds ESE at 5 to 10 mph. 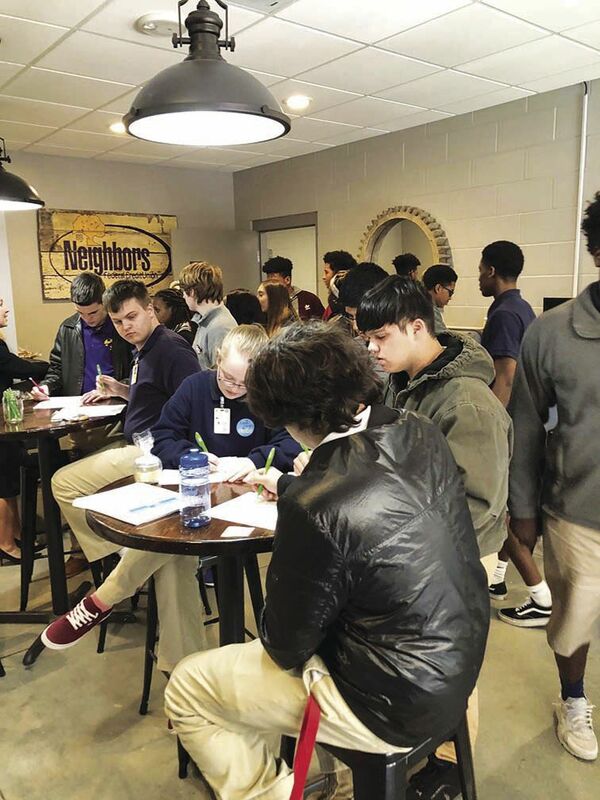 Denham Springs High School students take advantage of the school's financial literacy center, sponsored by Neighbors Federal Credit Union. 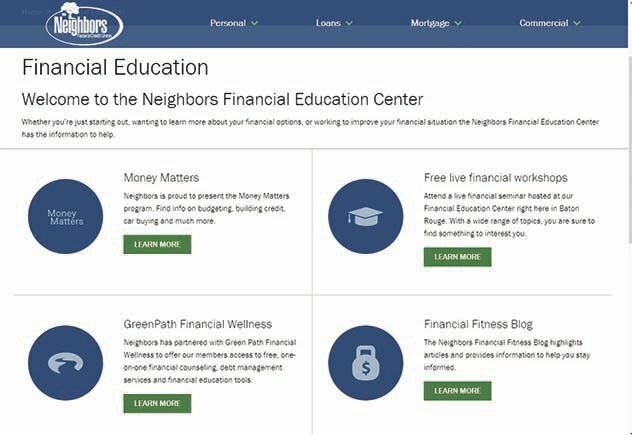 Neighbors Federal Credit Union's website includes information and resources to help both students and adults learn at financial literacy. Neighbors Federal Credit Union's Brandi Cummins, left, and Theresa Johnson are seen at the financial literacy center at Walker High School sponsored by NFCU. DENHAM SPRINGS – Neighbors Federal Credit Union announced the launch of an interactive, online financial education initiative through its new partnership with the nation’s leading education technology innovator, EVERFI, Inc. The program is called Money Matters and is available as a complimentary service to provide educational resources to the greater Baton Rouge community and area schools to manage their finances and plan for the future. Neighbors FCU is providing the financial literacy curriculum free of charge to any schools in its service area. This curriculum will satisfy the legislative mandate for schools to provide financial education as outlined in SB 315 signed last year. “With schools now being legislatively mandated to provide financial literacy education, the burden on schools to provide a quality education is higher than ever before,” said Steve Webb, Neighbors CEO/president. In 2018, Neighbors contributed a total value of $141,928 toward education, which includes $15,000 in scholarships from the Neighbors Way Tuition Assistance Award, $40,985 given back to local high schools through the Mascot Checking Program and $60,000 spent building new financial literacy centers at Walker High School and Denham Springs High School. In addition to the K-12 curriculum, Money Matters offers an assortment of adult financial education learning topics, with subjects including building emergency savings, mortgage education and retirement planning. Each learning topic is 3-10 minutes in length and was created to encourage participants to build financial confidence via a series of interactive activities. The mobile and tablet-friendly program is available in English and Spanish. Neighbors FCU will offer incentives for potential and current members to complete the educational modules. $100 added to a new Neighbors Federal Credit Union checking account after the account has been opened for 90 days for completion of the “Money Basics” modules. $250 in lender’s credit that can be applied toward closing costs of a mortgage loan financed through Neighbors Federal Credit Union for completion of the “Buying a Home” modules. 10,000 reward points added to the user’s Neighbors Clear | Elite or Clear | Point credit card for completion of the “Loans and Payments” modules. Every user will be entered for a chance to win $50 cash or gift card equivalent at the end of each month that a module is completed. According to Bankrate, 63 percent of Americans do not have enough money saved to cover a $500 emergency. “One of our top priorities as a credit union is to empower the communities we serve,” Webb said. In addition to the Money Matters program, Neighbors FCU has partnered with Green Path Financial Wellness to offer members access to free, one-on-one financial counseling, debt management services and financial education tools. All of this can be accessed at https://www.neighborsfcu.org/financial-education/.